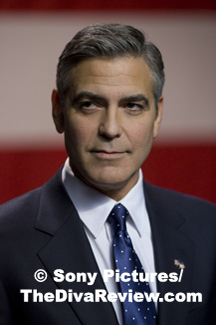 I make no effort to hide my esteem for George Clooney. 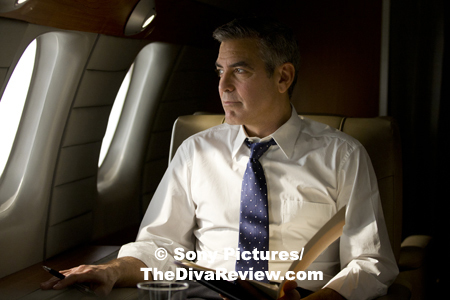 His rise from the television trenches on shows like The Facts of Life, Roseanne and ER to the highest echelons of fame as an actor, writer, producer and director in Oscar-nominated fare like Syriana, Good Night and Good Luck and Up in the Air is admirable. 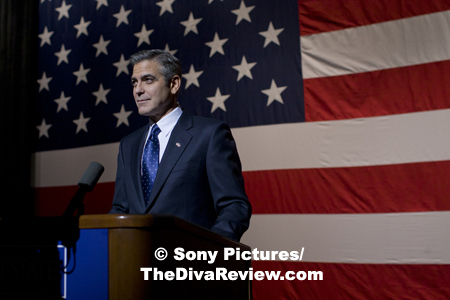 We greet his newest cinematic projects with good will and in the case of The Ides of March, not without a little titillation to see the politically outspoken Clooney turn his hand to a story about dirty politics. Stephen Myers is a bright young thing on the political scene. Stephen’s sharp mind plays the angles and variables of public opinion like flipping a Rubik’s Cube. In the cutthroat world of getting someone elected, he is a very valuable asset to have. Unlike so many of the career campaign hucksters around him, Stephen’s eyes still gleam with the idealism that brought him to this world to begin with. His faith in the well-meaning promise of Governor Mike Morris motivates him more than dollar signs. As long as he keeps his eye on the prize of getting Morris into the White House, all the noise around the campaign means nothing. Still, there is the road to contend with, and what causes a boy to lose his focus faster than a pretty girl? Molly, a lovely intern catches his eye and the tedium of being on the campaign trail passes a little quicker at least for a couple of nights. Of course, Stephen makes it perfectly understood that these rendezvous are strictly deniable and not meant to lead to any type of actual relationship. Apparently, this isn’t the first time the girl has heard this, a sorry fact which Stephen discovers via a 2AM phone call to Molly’s cell. 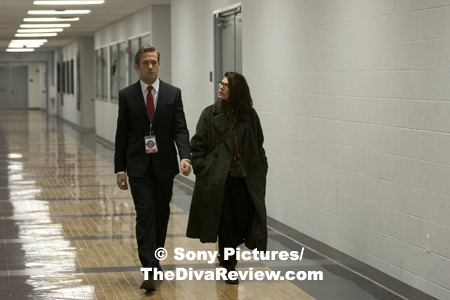 The young woman instantly becomes a ticking time bomb to everything Stephen holds dear. And because that wasn’t enough to handle; an ill-advised meeting with a rival campaign manager blows up in Stephen’s face, causing all sorts of ethical brouhaha and questions about Stephen’s loyalty. Finding out the news of his verboten tête-à-tête is going to hit the press reveals just how low others will go to eliminate Stephen and either derail his stellar career trajectory or the Governor’s campaign. 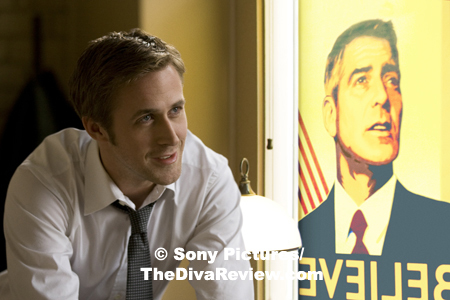 Much time in The Ides of March is spent on close-ups of its star, Ryan Gosling. This is a very good thing and not just for the obvious reasons. 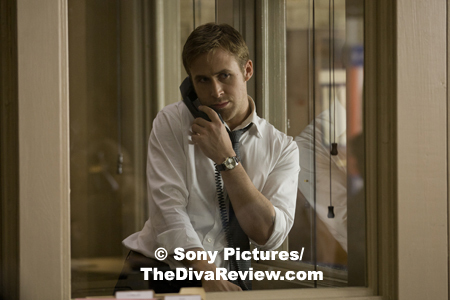 Gosling’s an actor with a face that either lets the audience know everything he’s internalising, or shutters down completely and lets us see none of it. Both those qualities are important to this character that only has himself to confide in in a world where everything must remain confidential. Any telecasted manoeuver; any perceived weakness is prey not only for the competition, but for the insatiable press, either of which could spell doom for the entire campaign. 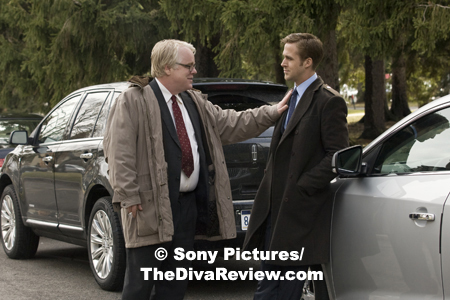 Philip Seymour Hoffman as the head of the Morris presidential bid conveys all the jaundice and weariness of someone who’s spent his entire adult life trying to get people elected to office. 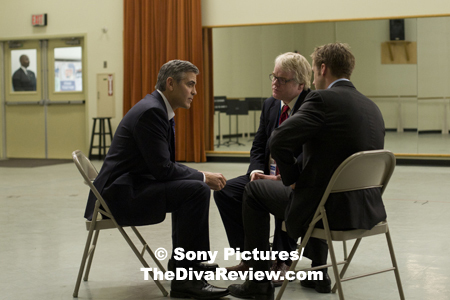 There is a great dynamic between Gosling’s and Hoffman’s characters that goes beyond mentor/apprentice as the older man could easily be Stephen’s template, though one can’t help but wonder if there is some jealousy at the rise of the young political star. 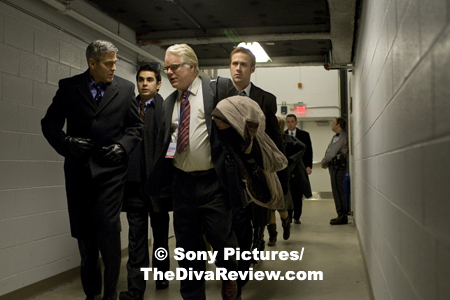 Evan Rachel Wood is the saucy, barely-legal intern who shares Stephen’s idealism about the candidate, but is faced with a more pragmatic turn of events that finds her in over her head. 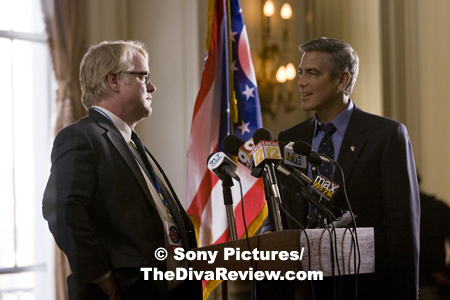 Clooney as Governor Morris is barely in the picture, but enough to make it clear why so many follow a charismatic leader who seems to be all good things. Pride and Prejudice’s Jennifer Ehle is glowy and wise in a welcome bit as Morris’s wife. 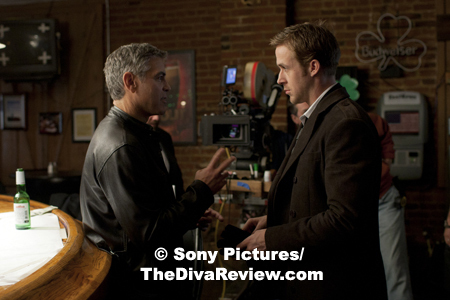 It’s also a beautifully photographed film; the intimacy that Clooney captures by use of rich, close shots of his characters makes the stakes more personal for its viewers. The problem with The Ides of March is that this is a story that’s awfully small. A thrice-told tale that everyone has heard before in some form or other, in fiction or reality; the young idealist forms a messianic attachment to a politician only to find out the object of his inspiration is a crumb. And really, is anyone surprised that political campaigns are double-dealing, back-biting hives of vicious, amoral behaviour? Is it a shock that politicians and interns go together like gravy and grits? 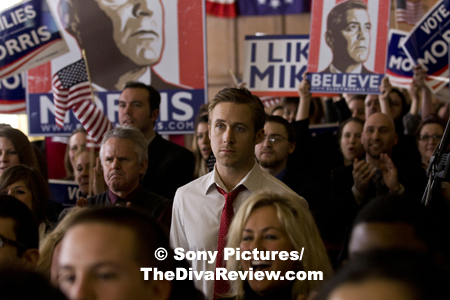 The Ides of March is told with low-key fireworks and no real surprises and that’s its trouble; there’s nothing in this script we haven’t seen before. 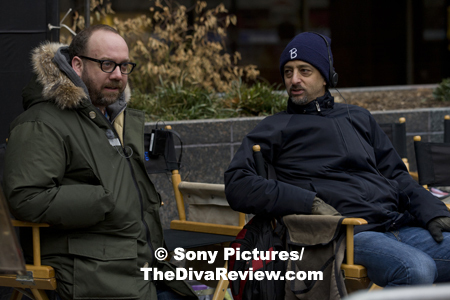 Most of the film’s intrigue lies externally with the filmmaker himself, a staunch and very public liberal and his choice to make a film about dirty dealings inside a Democratic campaign. 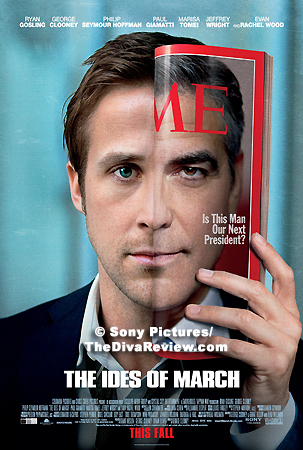 The Ides of March is a collection of lovely things; a gorgeously shot character study filled with wonderful performances ably structured by Clooney. My only wish was that all these ingredients had come together for a more compelling cause.